Recorded in Spring of 2018 after the Signature Breakthrough conference in Utah. Rob: All right, welcome to all our Becoming Your Best podcast listeners, I’m Rob Shallenberger. It’s a beautiful spring morning in Utah. So wherever you are in the world, welcome. We just finished our two day Signature Breakthrough Leadership conference in Utah last week. There were some amazing attendees. People from Canada, the Philippines, Costa Rica and all throughout the United States. What an incredible group of leaders and influencers. It’s always nice to sit down as a team afterwards and debrief from the experience and ask what can we learn, what can we improve from the experience so that it’s always better next time for our attendees? One of the things that has come up over and over, and not just as a result of the Breakthrough Leadership conference, it’s something that’s been requested by others around the world, is to create an assessment, a personal wellness assessment where people can see how they are doing. What are some of their areas of improvement and how does it benchmark? Not that we want to compare ourselves to others because Becoming Your Best is an individual thing. But it’s nice to have an assessment of where we are, because what you can do is once you take an assessment, you can then identify specific things you can do to find more happiness, more satisfaction and more balance in our lives. These assessments are very powerful tools to help us know what sometimes we don’t know that we don’t know, if that makes senses. And so, over the course of the next week, we’re going to be finalizing an assessment and by the time this podcast airs, if you’ll go to becomingyourbest.com, on a pop up, you’ll be able to take a personal wellness assessment and really evaluate different areas of your life and different points where you can do specific things to increase your happiness, satisfaction and balance. So by the time you’re listening to this, if you’ll go to becomingyourbest.com, you can take that assessment. Now, what I’m going to do on this podcast because this all ties in together, this assessment, the lessons learned from the conference is I want to share with you one of the biggest lessons learned that came from me. It’s not only from one of our attendees but there was another CEO who shared the same exact words and I’m seeing this repeating pattern and it’s something we already knew but it was a good reminder for all of us and that is. That is that it’s a combination of all 12 principles together that will help you lead a life by design rather than live a life by default. It’s the combination of all 12 principles of highly successful leaders that if you’re part of an organization, will help you create a high performing team. Just one or two of the principles alone won’t do it. They will fall short. So, where did this come from? I was skiing with one of our coaching clients about a month ago at Deer Valley and he asked, “What the secret sauce, what’s the one thing?” So we were talking about the one thing and what it might be. 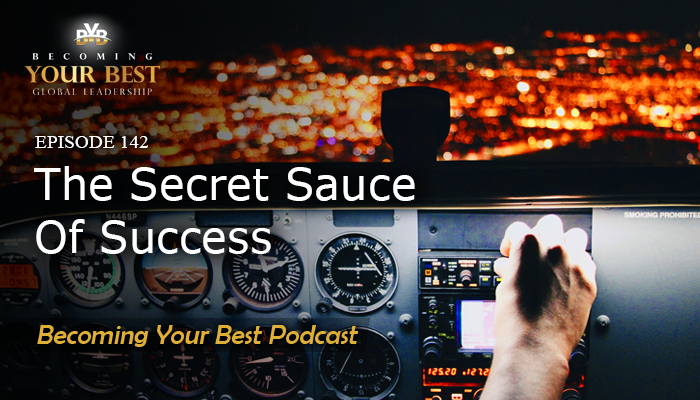 At the end of the day, he said, “My lesson learned, my big takeaway is that there is not one thing, there is not a secret sauce of success or happiness. That it really is a combination of things.” What a great observation on his part. Another CEO said the same thing after meeting with his organization. At the end of the day he said, after going through each of these 12 principles, his observation was that there’s not a single silver bullet of success and leadership. It’s only when you bring together these different principles and put them together as a real area of focus in your life and my life that happiness, satisfaction and a real peace and a high performance result comes from that. And so let me give you an example of what this means. If you are looking at your instruments, if you are a fighter pilot. You have all of these instruments and displays. You have an altimeter, this shows you your altitude. You have an attitude indicator that shows your position relative to the horizon and air speed indicator. What would happen if you were a pilot and you focused just exclusively on one instrument? Well, it wouldn’t work. I mean, you’re going to crash almost 100% of the time no matter what you’re looking at. I mean, you’ve got to know what your air speed is but you’ve got to know what your air speed is in relation to are you going up or down and how fast are you going up or down? So it’s a combination of these instruments. We call it an instrument cross check. If an instrument cross check breaks down, that’s when accidents tend to happen. I thought, that’s kind of perfect analogy of these 12 principles. You know, if you’re just staring at one of them, it’s not going to work. It’s when you have a cross check of the different principles that you really start to develop and have great relationships. It’s when we have a cross check on the principles that we really can find true happiness and connection in our life and then we can start moving financially to where we want to go. That we can be a part of a team where we’re excited to come to work. It’s that crosscheck of the instruments, so to speak, applied to the principles that makes the difference. Let me give you an example thinking about this. Principle number two of highly successful leaders, and you’ve heard us talk about this one a lot, which is to lead with a vision. Well, you can take that principle for good or bad. I mean, think about leadership and the impact of a great leader. Think about if you’ve had the chance to work on a team or for someone and most likely if you’re listening to this podcast, you’ve not only worked for someone or with someone but you’ve had different teams throughout your life. Have you ever worked for someone who you would consider to be a terrible boss or a terrible co-worker? Well, what was different about them? What made them terrible? And most likely, you dreaded getting up in the morning because you thought, “Oh, I’m going to have to face this person today,” and it really had a huge impact on your life in the negative way. At the same time, have you ever worked with or for someone who was a truly great leader? Who you felt like, man, I’m going to go be around so and so today. That’s inspiring, that’s exiting. What made them a great leader? If you really think about that question, ponder that on a drive in the car because really it’s a reflection on what can you do in your life to be a great leader. Leading your own life, leading your home life with your family, with your friends and leading a team whether you have a title or not. It’s interesting because these people who are terrible leaders did certain things that caused that. For example, maybe they didn’t recognize your performance. You know, they were dictatorial in the way they led. They got angry and upset. No one wanted to be around them. Or they had a bad attitude. All of these things violate different aspects of the 12 principles versus someone who leads with a vision and creates an excitement and passion. Like you feel like you’re a part of something great. Even if we’re talking about a family. You know, where you feel recognized and appreciated. They’re kind to you, they treat you right, there’s no guessing as to what direction we’re going. There’s a big difference in this kind of dynamic. So here’s the example I was going to share. Hitler had a vision. It galvanized a lot of people. A lot of people got behind his vision. However, his vision to exterminate the Jews violated principles number one and five and it was destined to fail. So yeah, could you say that he had a vision? Yeah, he absolutely had a vision. Was it an evil, terrible, horrible vision? Yes. It violated principle one of honesty and character and principle five of treating people right, living the golden rule, and so it was destined to fail at some point. Now, you get a vision that galvanize people for a good cause, that treats people right and can make a difference in the world, that’s a totally different feeling around that vision that unifies people. So the question is how these 12 principles, when they come together in your life apply to you. Let’s just go through a couple of them. Very specifically, I’m coming back to that assessment. What I would invite you to do is to go to the website and take this assessment and see where you’re at in relation to the 12 principles in your life. How well are you utilizing them for your success? To apply to your family and your relationships and your team and to see where you are. Let’s just go through three or four of the common ones and again see what impact they might have in your life. And since we’re talking about a vision, let’s come back to that one for a couple of minutes. It’s my opinion that the vision that you have in your life is the seed of your legacy. Now, think about that. If you don’t plant a seed what happens? It doesn’t even have a chance to grow. When we plant a seed at least it has a chance to grow and it can flourish into an enormous tree. But we’ve got to plant the seed. Now, this is something that I’ve come across lately and that is this thought. That once you have a vision, the question is, does your current reality, where you’re at in your life right now, align with your vision? Because if your current reality in your life, and I’ll say you but I’m really talking about all of us, if our current reality doesn’t align with our vision, there will be a feeling of discontentment. There will be an unsatisfied, unfulfilled feeling if our current reality doesn’t align with our vision. So the question then is, leading a life by design is what can we do to bring our current reality into alignment with our vision? Sometimes that can be difficult. There can be some hard choices there, and everyone’s different and that’s where, you know, coaching is an example and having a mentor and a friend that can walk us through that process and help us think clearly is so important along the way. But number one is, making sure we have a clear vision and that our current reality is aligned with that vision so that we really feel an authentic connection and excitement, and not just excitement but as one of the people who got certified as a BYB trainer said last week, he said, “It’s not just about being excited, it’s about having meaning.” Does your vision provide something meaningful for you? My dad said this and I caught this at the conference, “We need a reason for our heart to beat each day.” That’s part of what a vision will do for each one of us. When we have a vision, how important are the goals then and the milestones? Principle number three, manage with a plan. What is your specific focus for this year? Your goals, your milestones. Now maybe things don’t go as planned but that’s what great leaders do is when there’s a pivot or there’s a change is we get back up, we reassess the vision and reassess our goals and where are we today. What can we do to get that going towards the vision? So do your goals right now align with help making your vision a reality? And then taking it down to the weekly level with pre-week planning. One of our coaching clients said last week, you know, he’s got a very high net-worth, a very successful person yet his comment was, of all the things I’ve learned in my life, none has had a bigger impact in his life than pre-week planning. Think about why that’s the case. It’s almost a mini-meditation that you’re doing once a week, except you’re being very intentional. You’re sitting down with a pen or pencil and you’re scheduling your priorities rather than prioritizing your schedule. Each week you’re looking at your roles and asking yourself, what can you do and what can we do that matters most in that specific role? This is where a person cannot help but to be transformational if they’re actually doing this. Remember, the most important role in pre-week planning, now we’re on principle four, prioritize your time. The most important role you have in pre-week planning and that we have is personal. In other words, heart, mind, body and soul. What specifically are you going to do this week to take care of your heart, your mind, your body and your soul? Another way to look at that is physical, spiritual, mental and emotional. So meditation, exercise, those are all great things that we know are important. Sleep. When are you going to make that happen this week because that is part of living a long and prosperous life is taking care of ourselves. If we don’t take care of ourselves, we run the risk of a burnout at some point. I love what Albert Gray said, “The common denominator of success, the one secret of success is that successful people have the habit and discipline of doing the things that failures don’t like to do.” Now, failures is a pretty strong statement to say about someone because I’m never going to write anyone off ever. It’s why we’re here on this earth, is we can always do better and get better. I think what Albert Gray is saying though is that the common denominator of success is that successful people have the discipline and the habit of doing those things that are tough, that aren’t easy and that most people are not willing to do. That’s, I think, the intent of what Albert Gray is saying. Pre-week planning, it takes a discipline to do that on a weekly basis. It’s not easy to do. It’s why many people will not do it, you know, after four or five months yet they will very quickly in the same breath say, “Yeah, it was one of the most powerful habits I ever had.” Well, why did we stop? Now, just one more principle on this podcast and that is principle five. Live the golden rule. People will write us and they’ll say the platinum rule or this different variation. Whatever you want to call it. The bottom line in principle five personally is, how do we treat people? Do we treat people right regardless of who they are, regardless of their color, their religion, their race, whoever they are, do we treat people right? That’s the bottom line. If you’re applying it to a business or a team, the question is, are you creating a world-class customer experience or is your team so caught up in the day-to-day grind, so transactional that we’re letting our most important person, the customer, slip through the cracks? It’s easy to let happen for any of us. It takes a very concerted effort to treat the customer right and to treat people right. Now, in the spirit of vulnerability I’ll just share with you. You know, I’ve been a fighter pilot for 11 years. Fairly strong, type A personality. So for me the vision, the goals in the pre-week planning that very easily aligns with my personality. You know, very driven, very focused. For some people who are more of the connection and like to settle down and have a long visit, I can do that but it’s not in my general nature. I like to be very focused. You know, what’s the point and then what can we do? For some people that can be interpreted the wrong way as if, you know, I don’t care. This is where the assessment can be so valuable. I know that there are certain things that I need to do to better live principle number five so that I don’t come across to people as harsh or brash or uncaring because for a strong type A personality who just likes to get things done, that’s easy to do because we tend to like to get to the point and then come up with the action plan. And so after the conference, our good friend Danny and the coaching client, everybody at our two day conference has an accountability partner at the end of the conference. They choose two or three things that they will commit to do, come rain or high water in the next 30 days. Well, one of those things that I really wanted to focus on and that I am focusing on is doing at least one act of kindness for someone. What’s the right way to say this? It’s not that they don’t deserve it. But for someone who probably otherwise wouldn’t hear something very often. So for example the garbage man. What’s something I can do today to make his or her day a little better and when was the last time someone did something nice for them? Maybe it’s the janitor in the mall or a janitor in a building, when was the last time someone did something kind for them and paused to get to know their story for five minutes? You know, where are they from? What’s their background? And thank them for all that they do in keeping the building clean. So it’s not just a quick hello or opening the door for someone, my intent and focus on principle five is to go counter to what my natural personality is of being so driven that sometimes, those kinds of things are on the periphery. And so I’m really pausing intentionally, to try to be more kind, to have a very intentional act of kindness toward someone who otherwise, most of us might just brush right by. So that’s an example of what happens when we become intentional and focused on the 12 principles and bringing them all together. Again, it’s like that instrument panel. You can’t just focus on the altimeter and expect to not hit the mountain. You can’t just focus on the attitude indicator or the air speed indicator. If you want to get your destination, it’s about looking at all of these instruments together and they’ll bring you to your destination safely. It’s the same exact thing with the 12 principles. It’s when they’re brought together in our lives that a combination of excellence happens. That real peace, happiness and satisfaction and alignment with your true authentic self happens. So, this is just simply a refresher if you will. I’ve had the chance to take a few days and pause after our two day conference, thinking about lessons learned and one of the biggest lessons learned is that there is no single silver bullet of leadership and success. It’s when you focus on each of these principles that you can really achieve what it is that you want to achieve. And so, the invitation for this podcast is go to becomingyourbest.com and take that self-assessment. See where you’re at. What are some areas of your life that you can focus on that will help you find an inner confidence, more balance in your life and greater happiness. And then, after you take that assessment, I invite you to reread Becoming Your Best-The 12 Principles of Highly Successful Leaders. This is not a book to read once. You know, there are a few books out there in the world that you can read once and say, you know, that was great. There are a handful that you come back to every year and make a part of your yearly reading list. This should be one of them. You know, these are the things that great leaders and high performers do both in their personal life, in their families, in their relationships and within their organizations and their teams. So, after you take the assessment, I invite you to re-read Becoming Your Best specifically focused on the areas from the assessment where you feel like there is some room for improvement and then get very intentional about improving on those particular areas. The last thing I want to invite you to do is this, you know, if you’re listening to our podcast, you’re clearly one of our friends like a family member. Often times on Amazon people will evaluate a book based upon its ratings. So if you wouldn’t mind doing us a favor, we don’t ask much very often. If you wouldn’t mind going to Amazon and leaving a rating for both Becoming Your Best and the Transformation Challenge, we would appreciate the positive rating because it helps spread the word. It moves it up on lists so that people are aware of it. The real intent is that this can help and bless people’s lives around the world and you can be a catalyst in that process. So I’m wishing you a great day wherever you’re at. A huge congratulations to you for just listening to this podcast. It says a lot about who you are, your nature and your attitude towards becoming your very best. So I congratulate you, wish you a great day and a wonderful week. We’ll talk with you soon, take care.